L-R: Betty Jackson, Penny Hunt and Jan Burch. Everyone enjoyed the water conservation skit performed by members of the Trenton Country Garden Club at the club’s October meeting held at the home of Dianne Yonce. 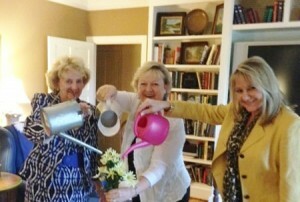 Betty Jackson, Penny Hunt and Jan Burch used watering cans to demonstrate an easy way to conserve water. Rather than allowing water to run down the drain as you wait for hot water to arrive at your kitchen sink, catch the cold water in a watering can and use it to give thirsty plants a drink. Though the summer was unusually rainy and, according to the April report of the S.C. Drought Response Committee that the drought is officially over for all South Carolina counties, water conservation remains an important and ongoing issue for each of us.